The Old Oak Dojo has two primary means of ventilation. The first is ‘natural’ or ‘passive’ ventilation controlled by the use of the windows and doors. We placed openings high and low to create a “stack” effect, pulling cooler air in low and exhausting it high up on the rear wall. This is augmented by a mechanical fan to accelerate the movement of air. 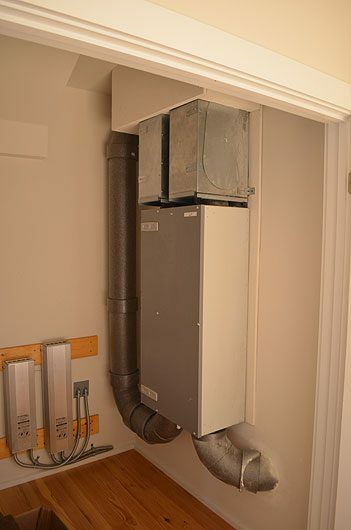 The second system is an ERV or energy recovery ventilator. This harvests the energy and humidity from interior air (through grills on the ceiling) and exhausts it out through an enthalpy wheel system that exchanges, or harvests, the energy (heat/cool) and humidity from the air. It exchanges this into the fresh air coming in to minimize any losses while quietly and constantly supplying a significant amount of fresh air, significantly improving the indoor air quality.